I should start by telling you that I am not a backpacker, I never got into it for several reasons, that I won’t go into here. I do however, hike sections of trails that are intended for backpackers, but do them as day hikes. If I can, I will combine a hike with a kayak float back down a river. There are many places in Michigan where this is fairly easy to do, like the North Country Trail near Lowell, and the Flat River, or farther north along the Manistee River for example. I will add information on these combination trips as time permits, I have a feeling it will take me years to fill this out the way I want it. I do most of my hiking during the fall, winter, and spring, summer usually finds me too busy kayaking and fishing. And, many of the places I will be listing are way too crowded for my liking in the summer months. Since I’m not a backpacker, I gravitate towards trails that loop, run near a river for a kayak trip back, or the trailheads are located at such a distance that I can walk from one to the next in one day. I am not a fast hiker, I spend a lot of time looking for photo ops while on the trails, but I try to do 4 to 8 miles as a day trip if I have the time. I can go farther, but then daylight becomes a concern, more than distance. I am going to group places by their proximity to Grand Rapids, my hometown. I will add links to more information where possible, especially maps of the trails if I can find them online, and in my reviews, I’ll try to add my GPS tracks if I have them for a particular location. These links should open in a new window, so if they don’t seem to work, it could be because of your pop-up blocker. The name of the place to hike is set as a link to a trail map if I could find one online, then the second link, “My review” will take you to a page that has my impressions of the trails for that location. I try to find maps issued by a governmental agency, not because they are better, in many cases they’re not, but because the links are most likely to work, and they are free. Here are a few of my favorite places with in 50 miles of Grand Rapids that I like to hike. The Pigeon River Country. It should be noted that no one should try walking any of the trails in the Pigeon River Country unless they have a map and compass, or GPS unit, and know how to use them. The Shinglemill Pathway gets a lot of use, but especially when you get into the Green Timbers Area, many of the trails are seldom used and very hard to follow. 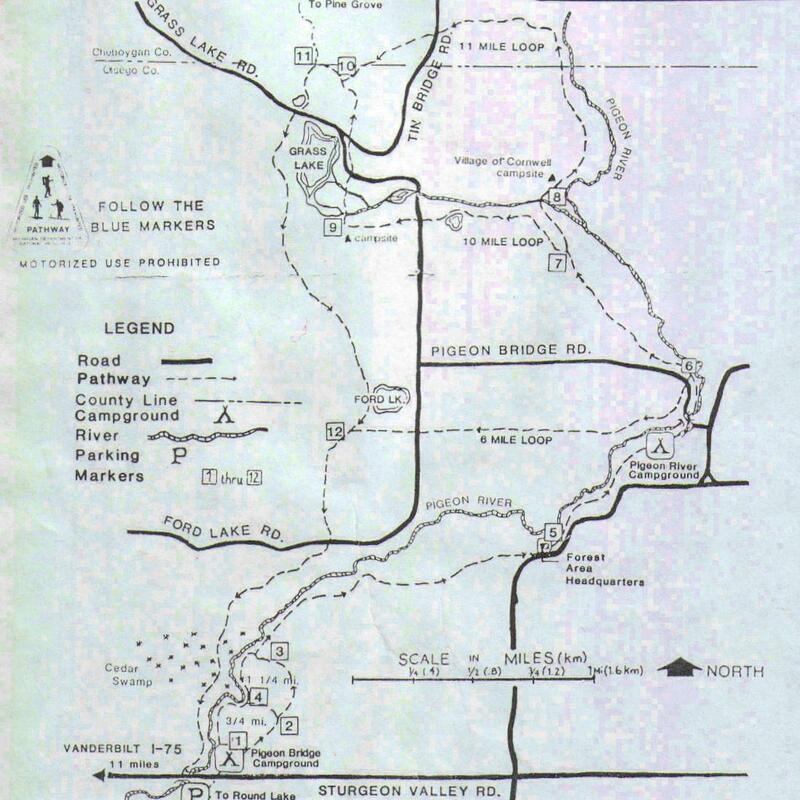 The PRC is the largest wilderness area in the lower peninsula of Michigan, and getting lost is a real possibility. The High Country Pathway Some details, not complete. The Green Timbers Area Details, photos, and maps. The Mason Tract Some details, photos, and maps.